2012 wheat harvest is off to a record start. 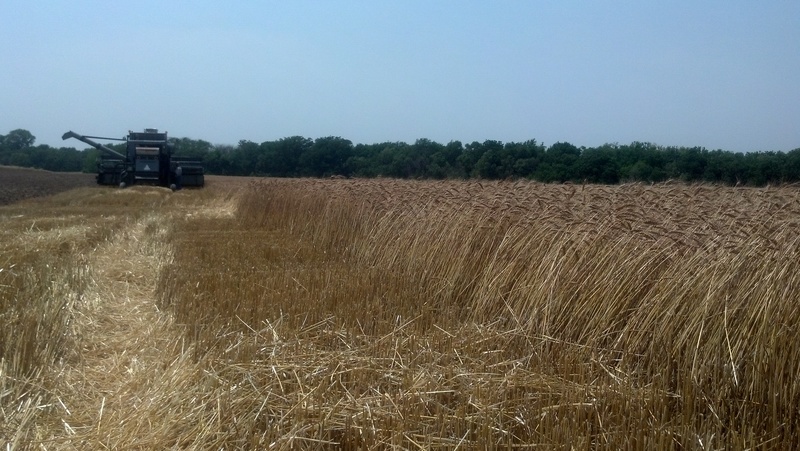 Wheat harvest is off to a record start this year . We started cutting on Saturday, May 26. That’s 15 days earlier than our previous record start date, according to my farmer-in-law, who has kept a daily journal for years and years. We had high hopes for our crop this year (and every year). We had good planting conditions last fall and good moisture during the growing season. However, by mid-April and early May, temperatures turned hot and the rains stopped. The plants were tall, but we get paid on the weight of the kernels, not the vegetation. We worried about the wheat kernels drying too fast. Small, hard kernels weigh less than plump, hard kernels. Wheat is priced per bushel, with each bushel of wheat weighing 60 pounds. We do quick calculations throughout harvest. We’re still early, but yields look OK. We won’t know for sure until the last scale ticket from the co-op. Looking forward to another day of harvest memories. I left the family farm fall of 61 and the last wheat harvest was custom cutting from Texas to N.Dakota. Gordon, you’re always welcome at harvest. Always lots of ham salad and watermelon to go around. Oh harvest time! I hope you are getting everything cut before all of these bad storms have rolled in. Almost, Lindsey. Two inches of rain last night, but no hail, so we’re happy about that. A day off of cutting today. « Why am I a CFCA sponsor? Click here to subscribe to my blog by email.